What They Say.....Here is a truth that can't be escaped: for Mia "Rabbit" Hayes, life is coming to an end . . .
Rabbit Hayes loves her life, ordinary as it is, and the extraordinary people in it. She loves her spirited daughter, Juliet; her colorful, unruly family; the only man in her big heart, Johnny Faye. But it turns out the world has other plans for Rabbit, and she's okay with that. Because she has plans for the world too, an only a handful of days left to make them happen. Here is a truth that won't be forgotten: this is a story about laughing through life's surprises and finding the joy in every moment. What I Say.....So I have had this on my shelf for a loooonng time. And it just kept getting put aside for other books, not because I didn't want to read it, but because it just didn't seem to be the right time. But I have recently joined a book club and December was my month to choose the book. 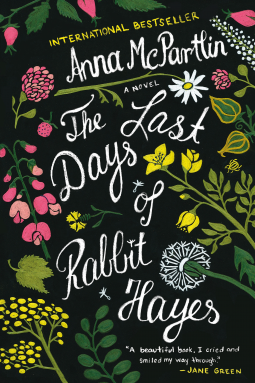 As I looked through my TBR shelf, The Last Days of Rabbit Hayes jumped out at me. I chose it and we will be discussing it on December 16, so I can't publish this review until after then. I will say straight off, there were a lot a tears shed reading this book. I thought it was going to be more uplifting, and it was in many ways, but there was no escaping that a daughter, sister and mother was ending her life way too soon. And as we begin to go back over Rabbit's life, we learn that her relationships are solid and loving and utterly ordinary but no less important. I don't want to offer any spoilers, and it turns out about as you expect even though I had moments where I thought this is one of the perks of writing a book, the ability to change the story, creating a happy ending where there isn't one possible in real life, but it wasn't to be. It ended as happily as it could and I shed a lot of therapeutic tears for Rabbit.